Let's get your account set up and your first request made! We are so happy that you have chosen Jar as your production management system and are glad to have you part of the Jar community! In this quick start guide, we're going to go over the basic features of your account, so you can get up and running with your projects and requests. 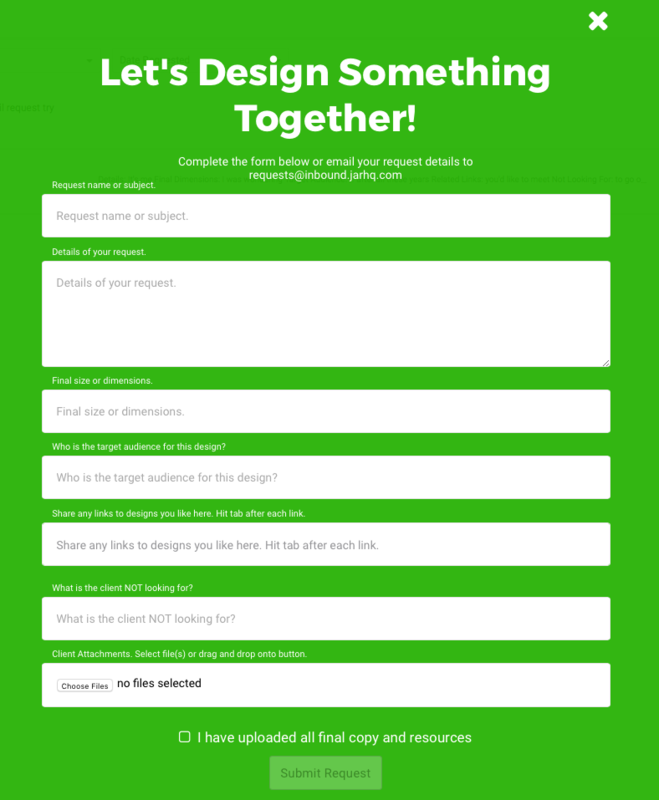 We're going to get your team set up, add your clients, and make your first request. Here's a quick video of how to get set up with Jar. If you're more into reading, that's cool too. Let's get cranking. - Admin: An admin has full access to your Jar account and can add, edit, and delete information regarding clients, users, billing, and requests. - Manager: A manager add, edit, and delete clients, and can access requests. - Full User: A full user can access all requests. - Restricted Access: A restricted user can only see requests assigned to them and requests assigned to any group they are a part of. Now that we have our team members, the next step is to add our clients in to Jar so they can start making requests. 1.) In the menu, click on "Clients"
3.) A pop-up box will appear asking for your client's information. Add their company name in the "Client name" field, and enter a description in the "Description" field if desired. 5.) Click on the name of your newly created client. Here you will be able to invite individual users from the client's company you just added. 6.) Click "Invite New Client User"
8.) Click "Invite Client User"
An email asking them to confirm their email address will be sent immediately to your client. Once they confirm their email address and select a password, they will have access to Jar and be able to submit new requests through the app. Also, once they have made a request they will be able to see their submitted requests in the app. Now that we have our team set up and our clients in the system, it's time to get to work and create some new work requests. 1.) You may submit a request on your client's behalf inside your Jar account. Note: At this time, you cannot email a request into Jar as a team member - only confirmed client users may send in requests via email - for more information see #2 below. Let's cover each of these. Here, you will enter the details of your clients request (your client will be able to see this information). Once you've added in all of the relevant information, check the "I have uploaded all final copy and resources" checkbox, then click "Submit Request". This will add the request to your list where you'll be able to edit it's status, assign a due date, group, designer, etc. Your client will also be able to see this request in their application once submitted. Clients can simply send an email to the above email address with a short description of the request as the subject line and the details of their request in the body of the email. Jar will recognize your client's email address and automatically add the request into yours and theirs request lists. Please Note: Your client must submit their request via the email address that is linked to their Jar account. If they use a different email address, Jar will not be able to determine where to route the request to. 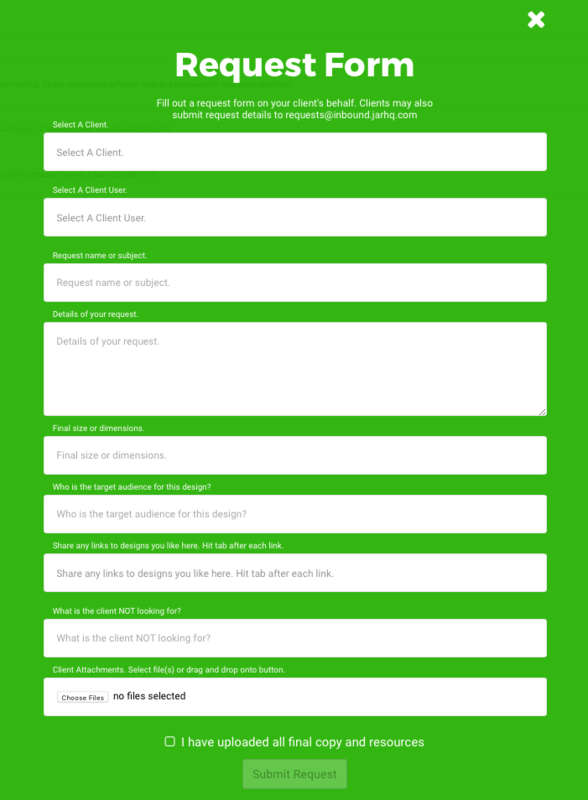 The final option for creating a new request is to have your client submit a request through the application. All they must do is log in to their account, click "New Request". A form will appear. Here, they can enter in the details of their request and submit it. The new request will be added to the requests list in yours and your client's requests list. In all these cases, you will be notified that a new request has been submitted. If this guide was helpful, click the smiley face button! If it wasn't, just let us know by hitting the chat icon in the lower right hand side and letting us know what you'd like to see.